LC Etheridge just achieved the highest level of coaching, receiving the MCC from the International Coach Federation. She says this was more of a transformation of herself rather than an achievement of work. In the podcast, she says that an Olympic athlete can't start working out and eating right a few weeks before the competition. To be the best coach, you have to start living like the best coach. 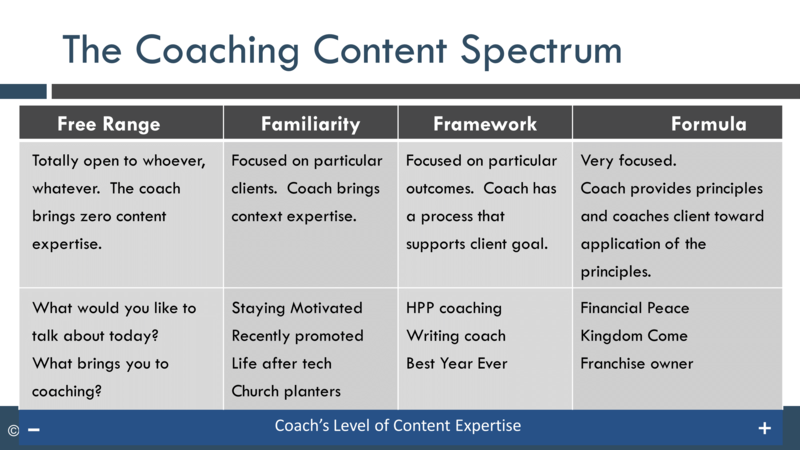 Framework coaching creates a way for the coach to bring some expertise into the coaching. This helps the coach create a healthy way to market coaching. 1. The framework comes out of listening to a number of clients in a particular niche. 2. The framework may suggest the topic for the client. 3. The framework may be linear or topical. 4. The framework does not provide the solution but creates awareness around an issue critical to the client's niche. 5. The framework provides a plethora of true statements that can be shared as appropriate. 6. Framework coaching makes it easier to attract clients. Diane Ingram, a certified and PCC credentialed coach and coach trainer who is also a spiritual song writer and had her own TV show. Diane shares with us four areas of personal development and how to coach each area. Chad and Brian give three answers to the question "How is Christian Coaching Different?" Coaching is a profession like cooking and plumbing. The basic skills are not any different than regular old coaching. 2. There are similarities and differences. The basic skills are the same, but we bring the power of the Holy Spirit. We bring concepts like forgiveness and redemption. We have a different view of what makes a person human. We know there is a purpose to life. This is where people get into trouble calling what they do coaching. If it's totally different, it isn't coaching.